We arrived yesterday afternoon to the sweltering heat of Denver! No big problems except for the fact that the air conditioning doesn’t work in our hotel room! We’ve called down to the front desk a few times and apparently they have to have the engineer manually turn the AC up. Ridiculous! 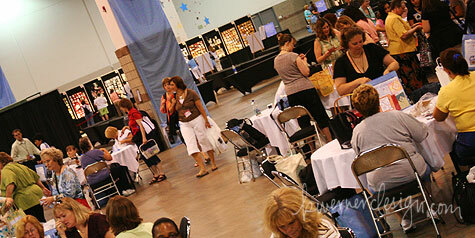 Anyway, we made our way over to the Colorado Convention Center this morning to check-in and get our bags. Hardly any line and we got our bags right away. In the past the lines at check-in were really long, but this year they changed the check-in process and now we check-in online and then just pick up our bags. Super easy! The SU! workers behind the counters seemed very happy with how fast things were moving. After getting our bags, we braved the line to get into Memento Mall (where SU! merchandise and little goodies can be purchased). There was a really long line, but it wasn’t too bad because we got to swap while in line! I only took half of my swaps, but they were gone before I got to the door of Memento Mall! On a side note, the cupcake swap card seemed to be a favorite. Those went the fastest. I did go to the Make Technology Work For You class. The new Demonstrator Business Web Site is wonderful! I will definitely be getting one as soon as the new web sites are rolled out. Anyway, I’ll leave you with some photos from the morning. We’re off to the Cheesecake Factory in a couple hours for an early dinner. After that, we’ll head back to the Convention Center for the Pajama Party! 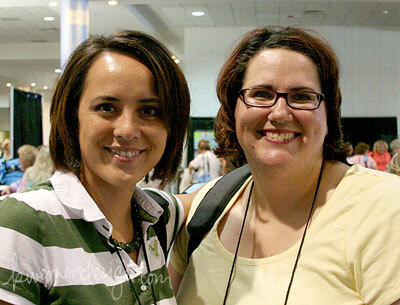 Two of my Convention “Roommates” – Kanani and Becky (kbot5 and ArticStampQueen at SCS). 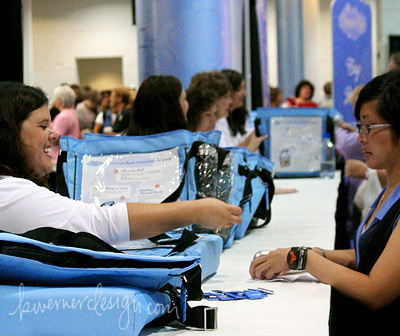 Check-in/Bag Pick-up – Shiloh Wilsted helps a demonstrator at the bag pick-up. The lines were extra short. All you had to do was hand your bag voucher to the SU! worker and they’d hand you a bag! The Gathering Place – Lots of boards with sample cards on them, plus many tables to sit down at–perfect for mounting the three stamp sets we received in our bags! Internet Caf√© – The Technology class took place in the Internet Caf√©. I heard there were no more seats in the class, but during my class at 11:30 there were many MANY empty seats. Quick Tip: What ink do I use?